ROCK CREEK BOOT FELT MINERAL 09 - Tight Lines Fly Fishing Co. The Simms Rock Creek Felt Sole Fly-Fishing Boot is an affordable felt sole fly-fishing boot that is designed using the StreamTread platform for the angler or hiker looking for all-round, heavy-duty wading footwear and is constructed with a die-cut footbed for a sturdy, wading-reading deck and the molded TPU heel clip that provides secure heel-hold & lateral stability for all day wading security and also features die-cut and molded single density EVA midsole for added cushioning for all day wading comfort. 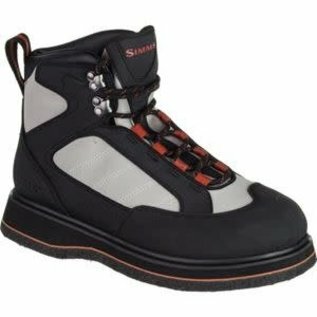 The Simms Rock Creek Felt Sole Fly-Fishing Boot provides fly-fisherman with really great traction and ability to stick to different types of stream/river bedrock conditions which is really awesome. This Simms Rock Creek Felt Sole Fly-Fishing Boot contains a lightweight design that is awesome for long hikes and is also made with a full-length retention plate and can be used with HardBite studs and also features Cut and Buff EVA midsole for extra comfort, durability and stability.